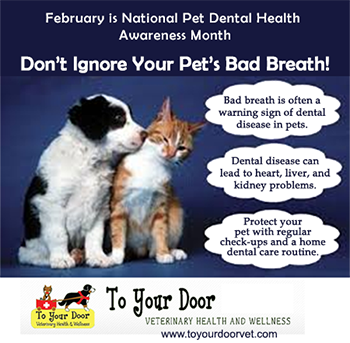 We at To Your Door Vet just about missed National Pet Dental Health month due to a dental health emergency for yours truly, Karen Bryant DVM. From this, I've learned to never, ever ignore dental, facial, or jaw pain. I will spare you the gory details, but the end result was a four-day hospitalization, unbelievable pain, and two weeks of missed work! Of course, our pets can’t tell us if they are in pain. And, because of their innate survival instincts, they tend to hide pain. Take a whiff…open their mouth and smell! Lift a lip… look for areas of red gums or heavy tartar. Regular wellness exams…Your vet will look for evidence of gum recession, infection and sensitivity. A startling statistic is that most pets have some form of dental disease by the age of three. If you think about it, that statistic is not so surprising for critters who do not brush their teeth or have semi-annual professional cleanings as humans do. Our pets are living longer these days due to better health care, so a healthy mouth is important as well. "That tooth must have been bothering Iris much more than I knew...she is like a different cat now! She is more playful and sociable and is eating better." TYD will offer free house-call dental evaluation AND a 10 % discount on all dental services through April 30, 2015. Schedule today!